Cazenovia College, Le Moyne College and Ignatianum Academy (a private college in Kraków, Poland) collaborated to provide students a unique two-week program. The SB/EN 400 Special Topic: Taking Responsibility course immerses students in Polish culture while living in Kraków, one of the oldest cities in Poland. This special topics course is just one of many real-life learning opportunities available to Cazenovia College students. As the historic center of Poland, the city offers students an environment rich in art and architecture with its famous examples of Gothic and Renaissance buildings as well as art galleries and museums. Students attended a lecture series at the Akademia Ignatianum, Jesuit University from Tuesday, May 15 until Thursday, May 24. Dr. Sharon Dettmer and Dr. Grazyna Kozaczka accompanied students on the trip and participated in the lecture series. Dr. Dettmer lectured on "This Way for the Gas, Ladies and Gentleman," while Dr. Kozaczka's discussions were on "Leadership and Literature: Taking Responsibility" and "Wistawa Szymborska 'In Conversation.'" The course is taught by faculty from all three institutions and presents a multidisciplinary view on leadership. 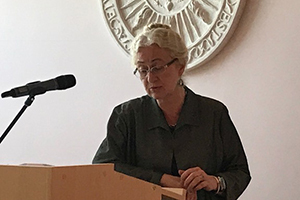 The course also foregrounds readings by authors with a close connection to Kraków, such as Joseph Conrad and Wislawa Szymborska, a Nobel Prize winning poet. Cazenovia College students Claire Oreskovich and Julia Dudley, along with two Le Moyne students, are part of this year’s special topics course on leadership through literature, focusing on the Holocaust. During the trip, the students had many opportunities for unique co-curricular and experiential learning as they visited Auschwitz concentration camps, and the Birkenau Memorial and Museum. Students could also visit the world famous Medieval salt mine and the southern mountain region (the Tatra Mountains). Students also had an opportunity to visit American and International companies located in Kraków, such as CISCO, Nokia, and Motorola. This course is one of the many faculty supported co-curricular and experiential learning opportunities available to Cazenovia College students. Faculty supported programs such as this construct purposeful student learning to occur beyond the classroom. At Cazenovia College, real-life learning leads to real-life success!